The Office will always remain my number one favorite show on TV, but this season, I have fallen in love. With FOX's AMAZING new show Glee, which makes me want to shout GLEEEEEEEEE! for the way it makes me feel. This is what being in a new relationship feels like, right? You want to talk about him/her/it all the time, you want to introduce all of your friends to him/her/it, it makes you smile whenever you think about him/her/it. Well, since I have no real human being in my life right now to feel that way about, I'm just gonna settle for feeling that way about Glee. Sometimes it's hard for me to fall in love with a show cause it inevitably and inexplicably gets canceled (I still miss you, Pushing Daisies and Veronica Mars...), but I LOOOOOVE Glee and it looks like many people do too. Here's a round up of EVERYTHING GLEE. 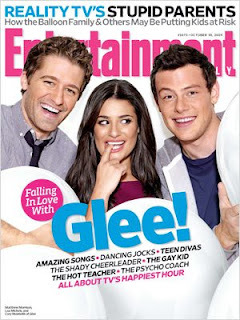 * I love Entertainment Weekly, and this cover story on Glee proves why. * A Madonna themed Glee episode coming next year, courtesy of the Material Girl, who gave the show the rights to all of her music! I love her post 90s stuff, so I hope they use some of her newer stuff rather than her 80s music. * Fox is cashing in on the Glee-mania, by releasing a DVD of the first 13 episodes of the season in December. Titled, "Glee Season 1: Road to Sectionals," it will make a nice holiday gift since it is scheduled to hit stores Dec. 29. Of course you can wait for the entire season to be over, but that DVD won't be in stores until mid 2010. * It doesn't even seem like there has been 10 Glee performances already, but LA Times ranks their Top 10. * While waiting for the release of the official soundtrack on Nov. 3, I've been listening to this Imeem playlist nonstop. LOVE LOVE LOVE! Hulu, I Love You - NOOOOOO! Hulu is one of the greatest things on earth. I can watch tv episodes because the bf hates America and discourages the purchase of DVDs. But with talks hinting at the possibility of being charged to view shows on Hulu .. what am I to do?? I mean, I guess it's no big deal, especially since most networks show new episodes on their own sites. But even so .. damn you, Hulu. I LOVE end-of-the-world movies. Alien invasians, natural calamities, uncontrollable asteroids speeding toward Earth, you name it. On my commute into work recently, I've been passing a huge billboard with the simple tagline, "We were warned." Ummmmmm. Creepy! And exciting! So I searched for "2012" (cause the billboard told me to), and came upon the new movie by the director of Independence Day (one of my favorites) and The Day After Tomorrow, Roland Emmerich. The premise of the movie is that the sudden collapse of the Earth's crust leads to global mass destruction, leaving few survivors to struggle for their lives. OK. This is the stuff I eat up. End of the world?? CHECK. Mass destruction?? CHECK. The guy who brought us Independence Day?? CHECK. So.. Why am I not excited upon watching the trailer?? Next Thursday, Oct 22nd, will be a big day in the computing world. It's the day Microsoft will get its dignity back after the ridiculiasco (ridiculous fiasco... just run with it) monstrosity that was Vista. Most people wouldn't touch it with a 10 foot pole and have stuck with Windows XP to this day. XP was launched in 2001. We're talking about an 8 year old OS and in technology years, it means XP would've had gone through menopause already and is now wearing Depends adult diapers. That's all about to change though because from first hand experience, Windows 7 is what Vista should have been. I know many of you will still hold on to XP with a kungfu grip but it's ok... let's let go and move forward. First thing they got right is that Windows 7 is STABLE. It doesn't crash, it doesn't burn, it doesn't give you blue screens of death. That's not to say that programs don't crash, but if they do, Windows 7 neatly closes the delinquent and you are able to move on with your life instead of frantically hitting Ctrl Alt Del. Second is that it just works. No more messing with drivers and hardware that is incompatible and the stupid "Hardware Wizard". New printer? 7 sees your printer, installs what it needs to, and you'll be printing in minutes. Last is that it's very polished. They named their new user interface "Aero" and the name fits nice because it really is kinda Aero-y. There's a lot of little things they did to make your life easier on a day to day basis. Folders are neat, Desktop is clean and the new Taskbar is actually useful! (I have a certain animosity towards the XP taskbar) You'll see what I mean once you get it. It's a bit pricey but do your homework and you can actually score one for pretty cheap. Oh and don't try to buy 1 disc and share between 12 of your buddies because I'm sure it'll be nothing but a headache in the future. I'll check back in on the 22nd to follow up so til then, have a good weekend. The Coolest Music Video EVER. This past weekend I went out to Seattle to see a good friend, and while I was out there I also had a chance to hang out with another good friend of mine, former LiB editor Yuri. Now, Yuri is seriously the go-to guy for cool sites/music/videos, and he actually gave me a lot of awesome recommendations, but the COOLEST thing he showed me this weekend is this music video by a Japanese group called Sour. For their single Hibi no neiro (Daily Melodies), they asked their fans from all over the world to submit videos of themselves singing along to the song, holding up signs, doing whatever, umm, you just have to watch it. It is SUPER creative and brilliant, not to mention MAJOR props for the editors who pieced it all together into what I am now dubbing the COOLEST MUSIC VIDEO EVER (Sorry Kanye, Beyonce has nothing on this). Just check it out below (the song is not bad either) and thank Yuri for this find! I kinda love Forever 21 for what it is, a mecca of trendy and affordable clothes that can be worn to death for one season, and tossed out the next. I mean, at this stage in my life, I can't exactly afford to shell out tons on really expensive stuff (so I shell out tons on really inexpensive stuff instead, ha!) and so I heart Forever 21. I also enjoy reading their blog from time to time, but this post on the recently concluded Paris Fashion Week caught my eye. 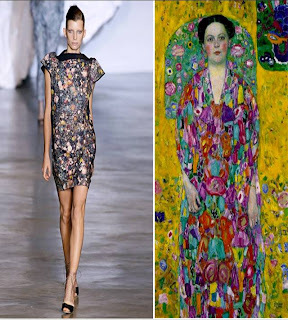 The blogger selected a couple of pieces from the runways and compares them to the art of some of the most famous modern artists. Modern Art, meet Fashion, Fashion, meet Modern Art. I LOVE IT! <3! I'm a bit obsessed with the Titanic. There's just something about the large-scale tragedy, and I love reading about it, I love watching the Leo DiCaprio movie, I just am kinda obsessed with it. I kinda thought I was strange for being so into something that is so.. tragic, but I recently found out that a lot of my girlfriends are equally obsessed. 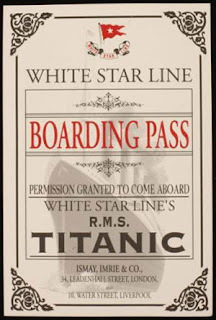 Which is why a group of us went to the Titanic: The Artifact Exhibition at the Discovery Center in Times Square. The exhibition is SO worth the admission price. Tons of artifacts pulled from the sunken Titanic, recreation of the ship's interior (including the Grand Staircase), discovering details from every aspect of the ship (did you guys know there was a deck called the Poop Deck?? Yeah, I giggled at this). My favorite part was the boarding pass they give you when you enter the exhibition, which belongs to a real life person who was on the Titanic. You go through the exhibition and at the end you look up if your person had survived or not. I lived. GO check it out. When buying online, enter "CITY09" to get $4 off your ticket. Mark your calendar, kiddies! Jim and Pam tie the knot on Thursday, October 8th. A couple of weeks ago I wrote about how excited I am about the upcoming Where the Wild Things Are movie, which is opening in 2 weeks! Well, Imeem debuted the soundtrack yesterday on its website, and it is all kinds of awesome. While the Arcade Fire song that I love (which is used in the trailers) is not part of the soundtrack, the entire album is composed and performed by Karen O of the Yeah Yeah Yeahs who I lurve. Win Win Win.